This Peppered Lavender Tenderloin Roast recipe is a “10” roast recipe that will be sure to please everyone you serve it to. The lavender flowers give off a gentle hint of lavender. Since I dried my own culinary lavender flowers this year, I have been experimenting with ways to use them in my cooking and this roast is a winner! 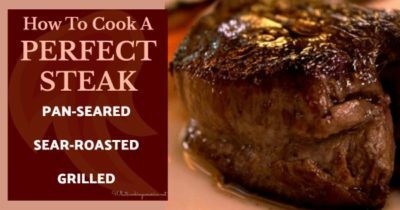 Be sure to try this beef roast recipe. Learn about Culinary Lavender and how to cook with it. Photo from Fine Dining magazine. * Lavender is an incredibly versatile herb for cooking. In today's upscale restaurants, fresh edible flowers are making a comeback as enhancements to both the flavor and appearance of food. Learn about Edible Flowers. Bring the tenderloin roast to room temperature before cooking. Trim the tenderloin of fat and silverskin. Silverskin is a silvery-white connective tissue. It does not dissolve when the tenderloin is cooked, so it needs to be trimmed away. If the silverskin is not trimmed off, it will cause the tenderloin to curl up into the shape of a quarter moon. If you ask, your butcher will do this for you. Once the tenderloin roast is trimmed, it no longer has any structure and will start to flatten out. As you want the meat as round as possible for even cooking and also for presentation, trussing is the key. Using individual pieces of kitchen twine/string to truss the roast. Tie the kitchen string around the tenderloin roast with equal spacing between each truss. Tie the meat firmly, but not too tight. NOTE: I usually have my butcher do this for me. Pat the beef dry with paper towels (this is important as surface moisture will interfere with good browning). Lightly oil the outside of the roast. In a small spice or coffee grinder or a mortar and pestle, coarsely grind the black peppercorns, white peppercorns, fennel seeds, thyme, and lavender flowers; rub mixture all over the meat. Wrap tightly in plastic wrap and refrigerate at least 2 hours or overnight (preferably). By browning the meat's proteins and sugars, you are enhancing the meat's flavor even more. The tenderloin roast that I cooked was approximately 5 pounds and would not fit in my fry pan. I used my large cast-iron iron griddle to sear it. It worked great! Heat a large cast-iron frying pan over high heat. Without adding any cooking fat, sear the roast on all sides (about 3 rotations, approximately 1 minutes each). Resist the temptation to constantly turn the beef from side to side and you'll be rewarded with a beautifully browned crust. When browned, immediately remove from heat. Tenderloin, like other lean cuts of meat, are best roasted at a high heat rather than baked at lower temperatures. Flavor comes from the browning, not from fat slowly melting into the meat. Place the seared roast in a large baking pan or roasting pan and bake, uncovered. Roast in oven approximately 20 to 40 minutes (depending on size of your roast) until a meat thermometer registers desired internal temperature (see below). NOTE: Turn tenderloin over halfway through cooking for even browning. When the tenderloin roast is cooked to your liking, remove from oven, and transfer onto a cutting board. Cover with a tent of aluminum foil and let stand 15 minutes before carving (meat temperature will rise 5 to 10 degrees after it is removed from the oven). Cut the roast into 1/2-inch slices. Transfer onto a serving platter and serve immediately with any accumulated juices. I had this and loved it while staying in The Dolce Hayes Mansion Hotel , San Jose . It is now firmly implanted as one of my fondest memories of America . Will look out for it in New York next year !